An inside look at three of the most important issues American Capital Agency is dealing with today. If you want to know what is really going to drive American Capital Agency (NASDAQ:AGNC) you need to get inside the head of the decision makers. The best way to do that is by going over the company's conference calls. However, if you'd like save time and avoid some of the jargon-laced commentary, here are three of the most important things discussed in their conference call this past Tuesday. 1. Rates will stay "lower for longer"
In December 2015, the Federal Reserve announced the first increase in interest rates in nearly a decade. As mREITs, American Capital Agency and peer Annaly Capital Management (NYSE:NLY) could be vulnerable to swings in interest rates for two reasons: leverage and spread. REITs generally rely on low cost funding in order to purchase their real estates or, in the case of mREITs, mortgage-backed securities. Rising rates make leverage for REITs more expensive. Additionally, interest rate increases would cause the price of outstanding mortgage-backed securities to decline. Investors often move towards government bonds during this time because the bonds are a low-risk investment that, as a result of rising interest rates, are returning decent yields. So if you were expecting American Capital Agency to discuss how they plan to navigate rising rates in 2016, then you would have been in good company but wrong just the same. Instead, the company's CIO, Gary Kain, said that "the market is beginning to recognize that the global economic headwinds are real, and that the U.S. will not be entirely immune to what is going on elsewhere in the world." He continued, "We also think it is just a matter of time before the Fed has to abandon its tightening bias." In short, Kain believes that interest rates are going to stay low for a while longer. MREITs have been playing defense since 2013 in preparation for rising rates. But, if Kain is correct, there is the potential for these companies to get more aggressive, which could help to generate better returns. Interest rates are important, but American Capital Agency depends on their ability to access financing. The mREIT business model is designed for these companies to make short-term borrowings, and then invest in longer-term fixed-income securities. Put simply, without reliable funding the house of cards falls apart. The concern is the new bank regulations are impacting lending. More specifically, banks are being forced to hold more capital, which could led to higher lending rates or less capacity for lending. American Capital Agency's executives acknowledged the threat, but feel confident in their position. The company currently has 36 different lending counterparties, and they believe these relationships should ensure them access to funding. Moreover, and this was the bigger news, American Capital Agency is on track to have its own broker-dealer up and running by the end of 2016. This subsidiary would allow the company more direct access to borrowing, and would serve as an additional source of funding. Also, executives seems to believe that these things have a way of working themselves out. If banks are going to lend less, then someone else will come along and fill the void. All said, Gary Kain and the American Capital Agency team feel good about their ability to access funds. The final theme was the surrounding the current valuation of mREITs. 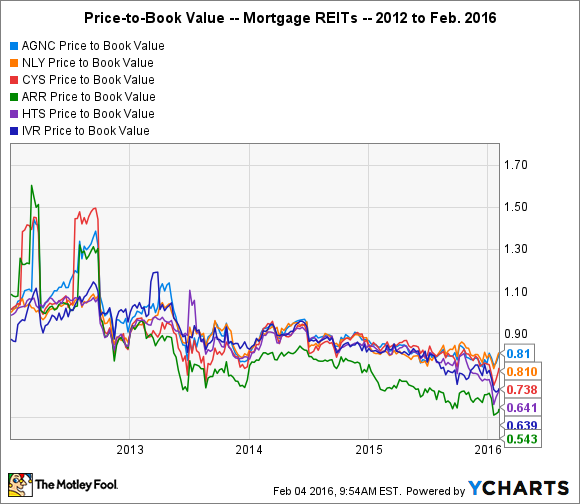 This has been a popular topic as mREITs a whole have recently been trading at 20%, or greater, discounts to their book value. Rather than simply preaching about the company's discount, American Capital Agency is putting their money where their mouth is. According to Kain, "Against the backdrop of significant price to book discounts, cheaper MBS [or, mortgage-backed securities, which are their major asset class], stable funding, and a view that we are not in a multi-year interest rate hiking cycle, common stock repurchases are compelling." During the fourth quarter, American Capital Agency repurchased nine million shares, or 2.6% of the company's outstanding stock, for $161 million. Kain added that mREIT valuations have become so attractive that he would consider buying the stock of other mREITs. However, he did have a caveat: He would only buy the stock of mREITs actively buying back their own stock. Whether or not it was intentional, Kain's comment looked like a clear poke at Annaly. Annaly announced in August of 2015 that they were authorized to buy back $1 billion worth of stock, but, unlike many other mREITs, has yet to pull the trigger. In fact, Annaly hasn't meaningfully repurchased shares since 2002. Looking back, 2015 was a year mREITs would like to forget. The combination of volatile interest rates, the timing of the Fed's rate increase, and generally negative sentiment about mREITs prospects led to a -12% return for American Capital Agency and a -4% return for Annaly. However, if Kain's bearish views on the economy are correct, things could be looking up. The belief is that their financing is solid, lower interest rates – rather than rising rates -- could allow them to become more aggressive, and you're getting a discount to book value and dividend yield above 12% for both Annaly and American Capital Agency, which could make now a compelling time to own mREITs.